Size: 0.25 in. long in an spikelike raceme up to 6 inches long. Notes: From Eurasia, now naturalized in the U.S. 3 species of Melilotus in Arizona. 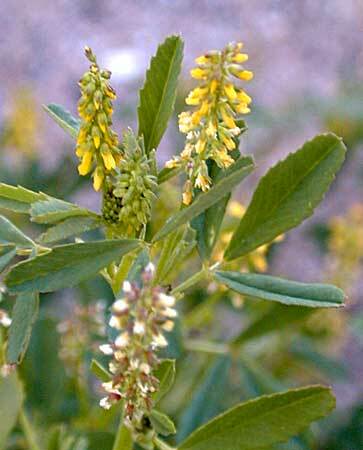 Yellow Sweet Clover entry in the online edition of An Illustrated Guide to Arizona Weeds , Kittie F. Parker, University of Arizona Press. Entry for sweet clover on the Cornel Poison Plants website. Notes on poisoning by yellow sweet clover from the Canadian Poisonous Plants Information System. Entry for yellow sweetclover in the University of California Statewide Integrated Pest Management Project.